Possible new TC gameplay mode? Discussion in 'Mapping Questions & Discussion' started by Username, Aug 29, 2008. Okay, so we all know that there's problems with hydro. It leads to turtling, and all of the battles take place in the center, away from the cap points, leading to stalemates. Many people proposed having the teams battle over a central point, but the problem is you'd need hidden control points for each point on the map to control the respawns, severely limiting the number of points you could have. However, I have an idea that might fix that. Looking at it now, it might have an inordinate number of unique rounds, but I think it's workable. The whole idea of this one is not to have a single control point in the center per round, but to use three points per round. One neutral point, and one point for each team that is their "bet" of sorts, along as being their respawn area. If the team is unable to take the middle point, the point they "bet" becomes neutral, and the battle continues there. So, let's imagine a playthrough on this map. The first round is randomly chosen to be in the order "BDE" Red fights well, and takes point D. Blue loses, and therefore point E becomes neutral. The next round is "BEF". Red has gotten cocky, blue takes back E, and B is now the neutral point. The next round is "DBE". Red once again loses, blue takes B, and D becomes neutral. As A is red's home base and the last point for blue to take, the next round is "ACB". Blue is on a roll now. They take the point within the first 2 minutes, and the round ends. A does not become neutral. Blue has everything but A, and so the final round is "AC". A has to hold out this round to have a chance at victory. Sadly, red fails, and blue wins the round and the game. So, in this game, the players went through 5 rounds. That is a fair amount of rounds, the minimum is four. But since you are fighting over a neutral point, depending on how long it takes to cap, the rounds should only last between 3-7 minutes. This means the theoretical game would have taken somewhere around 25 minutes, no longer than a game on dustbowl. So, do you guys see this as a feasible game mode? Another, perhaps easier and quicker variation could only use points B through F, with A and G being hidden points controlling the spawn for the final round. So the game would take one less round, but you could potentally get some pretty spotty level layouts. Cool idea. Sounds doable at least. Also if I understand you correctly each team would win 3 rounds in a row to win the map, for example red takes BDE, DFG, then FG. Unless Red is forced to take E after F then you would have BDE, DFE, FEG, EG. Unless there is a way to have the players choose their "bet" then there is no point in that being a factor. The game could just randomly choose one of the points to move on to. In essence you are describing TC game play with single points. Now if the teams had to cap the nuetral point THEN then other teams point, that would be more interesting. For example if red capped DE the next round they would go for FG and blue would fight for FE. [shakes head] so many possibilities. On the topic of the "bet", I was planning on it being random. What I was saying was that this way gets around the severe cap point limit in the original idea. And if they had to cap the neutral point, then the enemy's point, I noticed two problems. First, there's no way of fairly making a neutral point for the next round, unless you take one point from one of the teams. And once a team captures the middle point, it turns back into a very hydro like situation where the battles are in the center of the map. Furthermore the middle point would be too easy to take back, unless the team got forward spawns. Very neat idea. This could also make a viable arena tc (unlike arena_hydro). If fighting over BDE, I'd probably make only point D visible on the map, in order to avoid confusion with visible CPs that can't be capped. Normal rounds would be BCD, BCE, BCF, BDE, BDF, BEF, CDE, CDF, CEF, DEF. This is four more rounds than standard TC. Red defense rounds would be AB and AC, and Blue defense rounds would be EG and FG. This is two more defense rounds than standard TC. It could definitely work, but at the same time the map would be enormous. Granted, each area could be smaller, since you're making a round up of three different areas instead of two. But the problem is less in size and more in interconnectivity, particularly since for any given round, there are three possible points players could be fighting over, thus making the design require flexibility for all possible ways players could be traveling. This will be particularly difficult for rounds like BEF, which have the potential for red to own B and blue to own E, such that blue could be at a significant advantage. 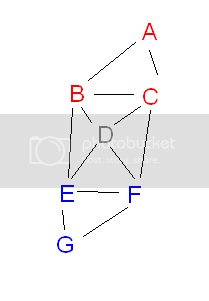 I might suggest cutting out C and F, and connecting A and G to D.
Top priority round would be BDE, and would be pretty easy to design so that it gives a unique play experience depending on who owns what point. Mid priority rounds would be ABD, ABE, ADE, BDG, BEG, and DEG. The difference of these rounds is that they would not cause A or G to go neutral if those teams lost. Defense rounds (lowest priority) would be AB, AD, EG, and FG. If defenders win, attackers' point goes neutral. This still has a few more rounds than standard TC, but the interconnectivity is much easier to manage. The minimum number of rounds needed for a team to win is three, similar to standard TC. BDE would have three possible ways of playing, depending on neutral point. ABD and EFG would each have two possible ways of playing, depending on neutral point (because A and E would never be neutral). All other rounds would only have one possible way of playing. Now, for the biggest obstacle, which I just realized when thinking about possible round selections. The game picks randomly from the highest priority rounds in which there exists at least one red owned point and at least one blue owned point. This means that in either scenario, round ABE may be chosen even if red owns both A and B! Fortunately the team_control_point_round entity accepts Enable and Disable inputs. You'll have to figure out the logic to forcibly disable all rounds that don't contain the neutral point, until such time as the final point for the team is the only one remaining. Final defense rounds probably don't need to be disabled, since they'll be lowest priority anyway and never picked until all higher priority rounds are either fully team owned or disabled. A collab would be great. I've been afraid to start anything for the idea alone because I've already got a map I'm working on, and I want to make sure I go through with a project for once. Actually, I was planning for the round to end when the central point is captured. Both non-neutral capture points are locked, except in the final round. That way, almost all of the fighting would be at the neutral point, not at an area in between. Also, this makes the rounds relatively quick, a little longer than arena games. So the additional rounds are offset by shorter round lengths overall. And since almost all of the fighting will be near that central point, it should be fairly easy to make the battlefields equal no matter what the round layout is. Furthermore, I was planning on following valve's tradition of making it more difficult for the losing team, to make for less stalemates and back-and-fourth games. I'm not sure what you're saying in this last paragraph. The neutral point is always the middle letter, with red owning the lettered point on the left, and blue owning the point corresponding to the point on the right. So BDE would always be the same area. I'm not that worried about the complexity of the logic, as I'm a programmer first and a mapper second, so I've worked with concepts that complex before. It'll require a large number of logic_relays, but otherwise it should be pretty manageable. Right, but you're still dealing with interconnectivity between spawns and the central point. For the layout to work with spawns being selected by the "bet" points, the spawns would need to be at those locked points. So you still have to figure routes from spawns to the neutral point in such a way that all paths are relatively balanced, and you can't just set up a single sentry to deny the other team entry to the neutral area. The only way to make it so that players spawn in the neutral area to duke it out is with a massive amount of spawn enabling/disabling, which is buggy, and would largely defeat the purpose of trying to use this setup for single-point TC. In game terms, there's no difference between rounds "BDE", "BED", "DBE", "DEB", "EBD", and "EDB", given the semantics you describe. They are all the same round. The TC mechanics don't care which of those points is owned by blue and which is owned by red when it makes its selection. So if that round is chosen, you have to make sure that all possible combinations are accounted for in the design. I think a big problem with hydro is that there isn't enough space for all the connections between the points. The diagonals end up with only 1 route that just turns into a spammy mess. With that many connections i can only see things being worse. You can pretty easily do it with one point so you don't have to have any connections at all. I have my tc map set up so that all rounds are connected to a master control point. When a point is captured it reassigns the master control point to the winning team so the next round takes place in one of the losing team's territories. It seems to work pretty well, the only problem i have found is you can't change the points back to neutral until 5 seconds into the round so you can see it change in the HUD.